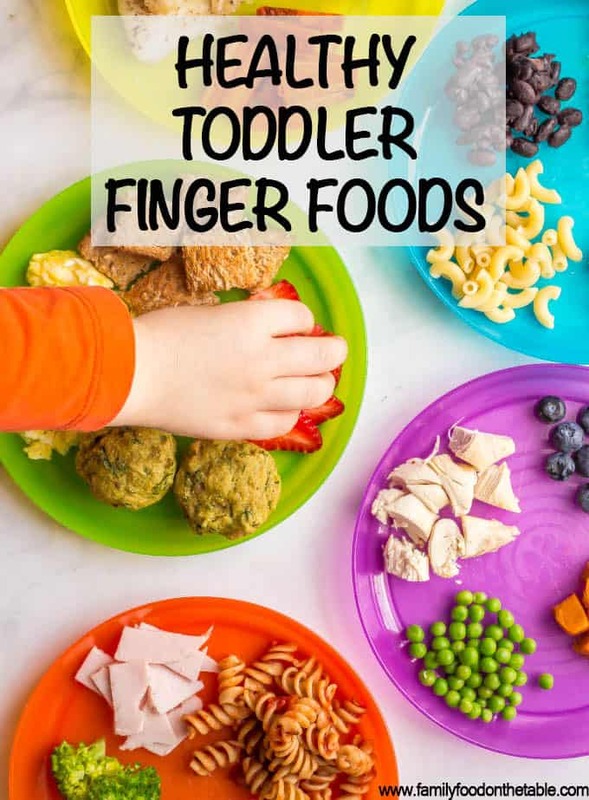 Healthy baby finger foods and toddler finger foods — It’s a fun milestone for children to explore new foods and learn to feed themselves. 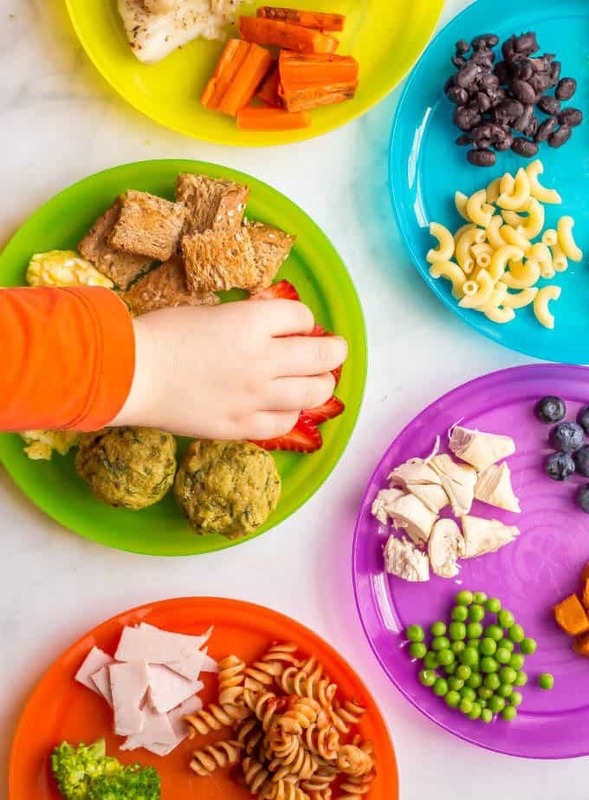 But it can be stressful and intimidating, so this resource answers all your questions about when, how much and what to offer for finger foods, as well as what’s not safe and how to get your child started on a healthy eating path. Today it’s ALL about healthy baby finger foods and toddler finger foods. I’m going to break things down and try to answer ALL your questions about this fun transition. Watching your baby or toddler start to feed themselves, seeing that joy and pride as they are able to do it themselves, it’s an important milestone. It can also be stressful though. Knowing what’s OK to feed your child, what’s not OK, and how to offer foods can be intimidating. And I’m just gonna say, it’s scary when they occasionally gag on a food. It will happen – it’s totally normal and part of the process (and gagging is not the same as choking). I also found meal-time became much more time-consuming when my kids were feeding themselves. And much messier. It gets better. Hang in there. 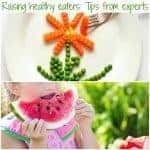 And whether you are offering healthy finger foods for babies who are doing baby-led weaning, or just adding them along with some baby food purees, or whether you suddenly find yourself in need of sending toddler finger foods for day care, I hope this introduction and FAQ helps you get a handle on how to get started. Finger foods are small pieces of soft food that a baby can pick up and feed itself. 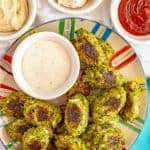 Examples of common first finger foods are small pieces of cooked, soft sweet potato, pieces of ripe banana, strips of ripe avocado, thin soft cheese sticks or cubes and O-shaped cereal. When should I introduce finger foods to my baby? Babies can begin solids around 6 months of age. Some families will choose to use baby food purees (I did with my homemade baby food) and others will opt for baby-led weaning, or a combination of both. Regardless, babies can begin practicing picking up some of their own food at 6 months and many will start by 8 months. By about 9 months of age, they will have the fine motor skills to better grasp and pick up their own food. A baby learning to feed itself needs practice! It will be slow at first and they may struggle, but it’s important to let them keep trying without rushing the meal or jumping in to help every time. They’ll improve faster and also enjoy the confidence and independence that comes with self-feeding. As always, consult your pediatrician with questions about feeding your child. How do you serve baby and toddler finger foods? Make sure each piece is bite size for your child. For some foods, cutting them into thin sticks will help them grasp it and get it to their mouths to take bites of (especially for children under 9 months old who may not have developed the pincer grasp yet). Young babies who have trouble with slippery foods might benefit from a little “dusting.” You can crush up some O cereal and roll the slippery food in it to help them be able to grip it better. And then, just pile a variety of foods onto your baby’s plate or high-chair tray and see what they sample! What baby finger foods and toddler finger foods are safe? What foods are not OK to serve a baby or toddler? How much food should I feed my baby? The answer here depends on the age of the child. Food for babies under age 1 is “just for fun,” as my pediatrician told us. Before age 1, babies are getting all of the nutrition they need from breast milk or formula, so food is just a bonus for them to be exposed to new flavors and textures and develop some healthy eating habits. So if your baby doesn’t want or eat much, don’t fret. Just keep offering small amounts to let them practice and adjust to feeding themselves. I happened to have BIG eaters with both of my children and I would offer several foods at each “meal” of their day. I started with just a couple of tablespoons of each food — I didn’t want to waste it if they were only going to have a small bite — and then moved up to about 1/4 cup of each food as they wanted more. Check out this sample menu for a one-year-old from the American Academy of Pediatrics. How much food should I feed my toddler? Toddlers need between 1,000 and 1,400 calories a day. It varies a little depending on their age, size and activity level (though pretty much every toddler is very active!) These calories should come from healthy foods in every category: protein, grains, fruits, vegetables, some healthy fats, and milk and dairy. Toddlers should be eating 3 meals a day and 1-2 snacks per day. 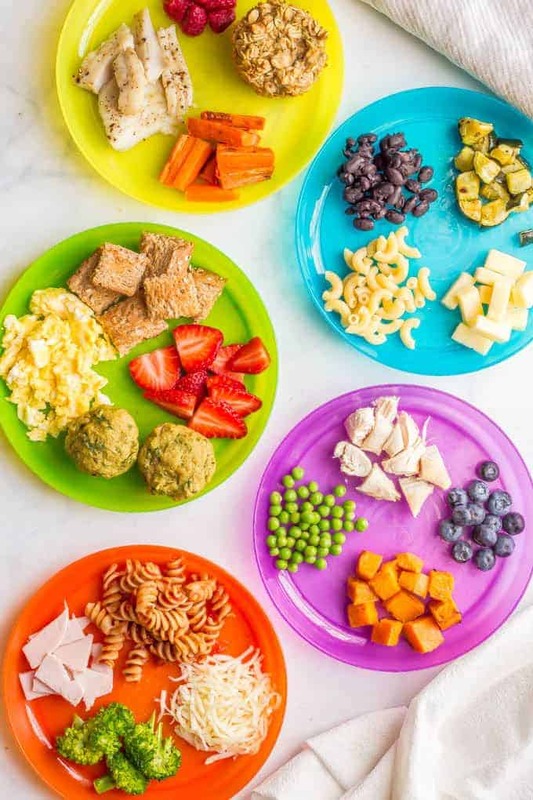 The daily serving recommendations for 12- to 24-month-olds are about 3 servings of grains (preferably whole grains), 1 serving of fruit, 1 serving of vegetables, 2 servings or protein and 2 servings of milk/dairy. 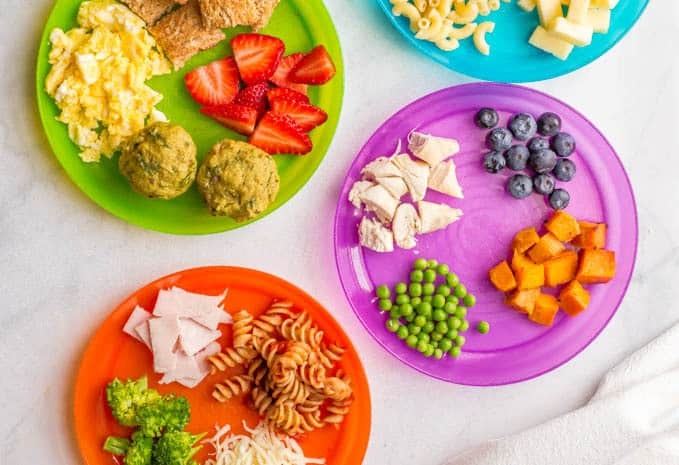 For a child that’s between 2 and 3 years old, the servings increase slightly to 5 servings of grains, 1 1/2 servings of fruit, 1 1/2 servings of vegetables, 2-4 servings or protein and 2 servings of milk/dairy. Check out this sample menu for a two-year-old from the American Academy of Pediatrics. Make mealtimes relaxed. Let your baby or toddler decide what and how much to eat. Don’t make mealtimes a battle and try not to use food as a bribe or reward or require your child to finish everything. You want to set the stage for a healthy relationship with food and a positive view of mealtime. Sit together as a family when you can and focus on being together and conversation rather than the food on the table. Don’t worry if your child refuses certain foods or doesn’t eat as much fruit and veggies as you would like. 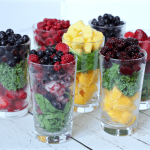 Try not to scrutinize what they have in a given day but rather look at a week or two at a time and determine if they’re getting enough of all the food groups and getting a good variety of healthy foods. Also don’t be concerned if they don’t seem to eat very much at any given meal. Young children are very good at listening to their hunger and fullness cues and they can regulate how much they eat. They may go through stages where they are chowing down on everything in sight and other times where they seem to barely pick at their food for days. It usually balances out. It can take dozens of times offering a food before a child will even try it. Yes, before they will even taste the food. And many more times in some cases before they develop a taste for it. So be patient, keep offering and hang in there. It can help to offer new foods with old favorites, particularly for older toddlers with more experience. They can be more willing to try something new if they see they have other foods on their plate that they are familiar with and enjoy. There you go my friends! 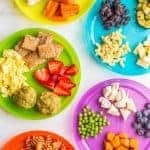 All about baby and toddler finger foods and the fun journey that begins when your child gains that bit of independence and control. 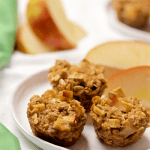 And don’t forget to check out my list of healthy toddler finger food ideas! Finally, please let me know in the comments below if you have other questions – I’m happy to help!